offline by downloading application from the official website www.udhd.jharkhand.gov.in. The educational Qualification required to apply for this post is candidates must have passed Diploma in respective Department i.e civil/electrical/mechanical Departments from Government polytechnic Institute of Jharkhand. Candidates are selected based on their experience and merit category and also short written &personality test will be conducted by them. The contract period will be 3 years or till the regular appointment whichever is earlier for this UDHD Jharkhand Junior Engineer Jobs. 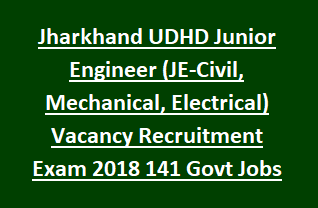 The prescribed age limit to apply for this post is minimum 20 years and maximum 28 years.The starting to apply for this post is 4th january 2018 and the candidates should apply on or before 05-11-2018 for jharkhand UDHD Junior Engineer( Civil/Mechanical/Electrical) Vacancy Recruitment Notification 2018. The starting date to apply is 11-10-2018. The last date to apply is 05-11-2018. The lower age limit is 20 years and the upper age limit is 28 years.Further age relaxation will be application as per the policy of Government of Jharkhand for SC/ST and PW/PHD candidates. The candidates must have passed Diploma in respective Department i.e civil/electrical/mechanical Departments from Government polytechnic institute of Jharkhand. The contract period will be 3 years or till the regular appointment whichever is earlier. The candidates should pay application fee of Rs.2000/- via NEFT. Candidates will be short listed after preliminary scrutiny i.e based on their Experience and merit category by Jharkhand UDHD.The candidates who are shortlisted will be selected based on short written test and Personality Test after the preliminary scrutiny. Exam will be conducted on general topics and subject related to respective Departments i.e civil/electrical/mechanical. How To Apply Offline for Jharkhand Housing Department And Urban Development JE posts. Interested candidates can apply online for this Jharkhand UDHD vacncies through official website of http://qgen.in/juidco/register/adv.php. Last date to apply online is 05-11-2018. The eligible candidates can apply by downloading application from www.jharkhand.gov.in filling the required details along with detail CV in the prescribed format, self attested copies of educational and professional qualification certificates & mark sheets, affidavit in prescribed format, experience certificate.The duly filled application should be send to the following address..